Today marks the first day in which Sony’s first Xperia smartphone lands in Canada. Previously, all Xperia handsets were branded Sony Ericsson, but this new path is part of Sony’s “One” direction. 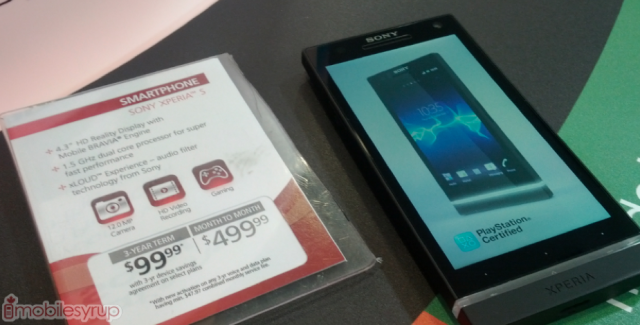 The Xperia S is available to all Canadians today, but only at Sony Stores and there’s only “a limited number” available. The price is set at $99.99 on a 3-year and can be hooked up to Rogers. The no-term price is $499.99 outright. Earlier this morning I took a stroll down the the Toronto Eaton Centre location and although there was no lineup, the sales reps stated that many people have pre-ordered the S for a pick-today. The Xperia S is an Android-powered device that runs OS 2.3 Gingerbread – it’ll be upgraded to OS 4.0 at some point this year – and has a 4.3-inch Reality Display (1280 x 720), PlayStation certified, 12MP camera that shoots 1080p HD videos, 1.5GHz dual-core processor, 32GB storage, NFC, DLNA, HDMI and Wi-Fi. Our initial hands-on is here and we’ll have a full review up soon.